WELCOME TO MY 400TH POST!!!!! I can’t believe our four week series has come to an end. I have to say I have thoroughly enjoyed showing you 4 easy- to- recreate hairstyles. Today is one of my FAVORITE looks! This one is a great one to pull out of y0ur hat when you feeling bored with your normal look and want to add some pizzazz! 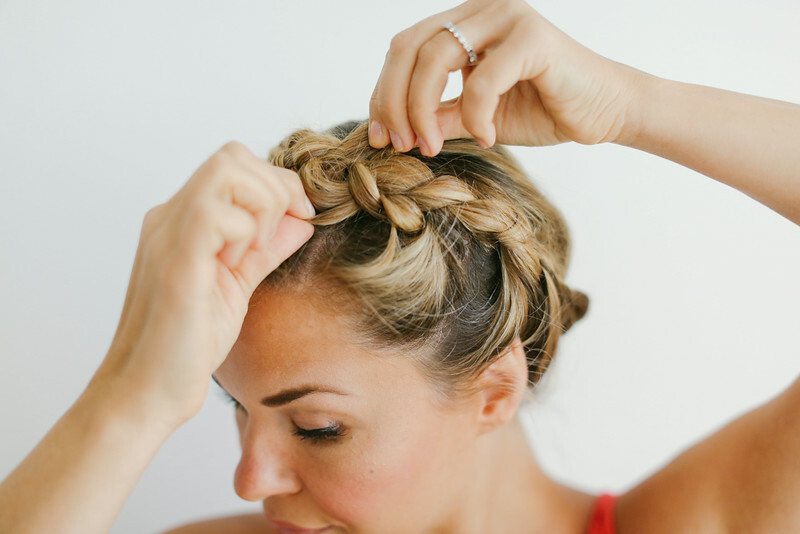 The wrap-around-braid I feel is perfect for anything romantic- a picnic, date, a wedding. You name it. Let’s get started! Part your hair off-center (I like to part mine right where my eyebrow arches up). 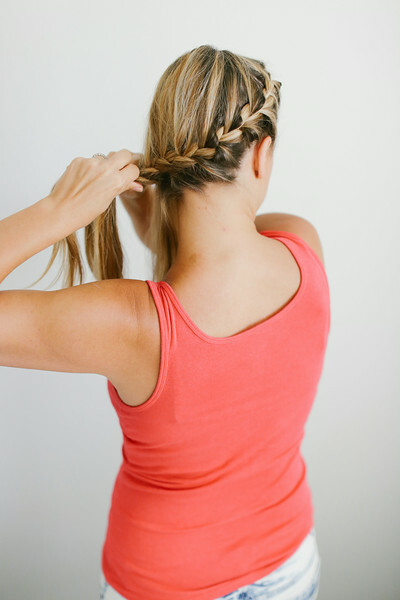 Now start French braiding like you have done a million times. Try to keep pulling your hair over to your ear. 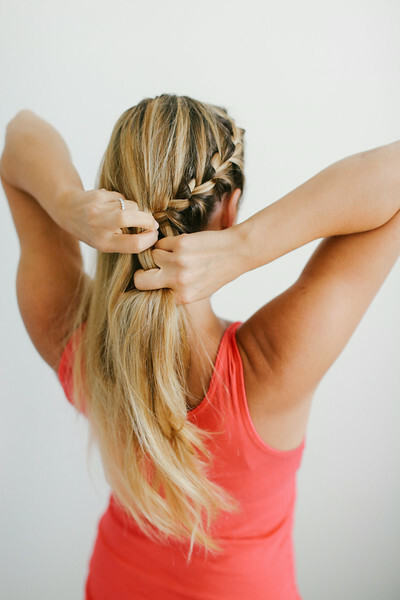 When you braid, use that tension to stay on the perimeter of your head. 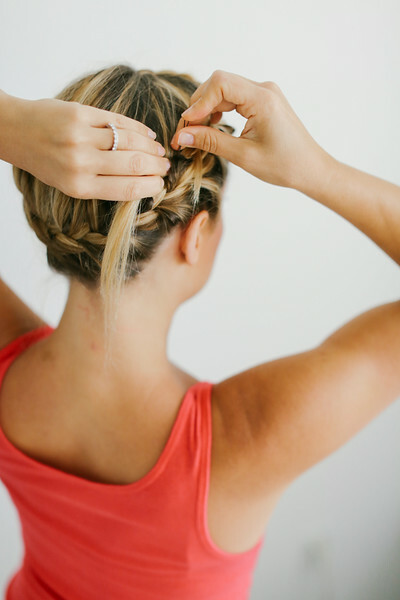 Every time you keep pull hair into your braid, keep focusing on staying on the outside. Ok you have made it 3/4ths around your head. Great job! THIS IS THE ONE TRICKY PART!!!!!! This is where you have to switch your hands. I suggest closing your eyes and really focusing on the three strands of hair in your hand and transferring to your other hand. You must move your hands to the other side of your head to finish this process. You got this! Don’t over think! Fab! Keep braiding up and you’re almost home free. 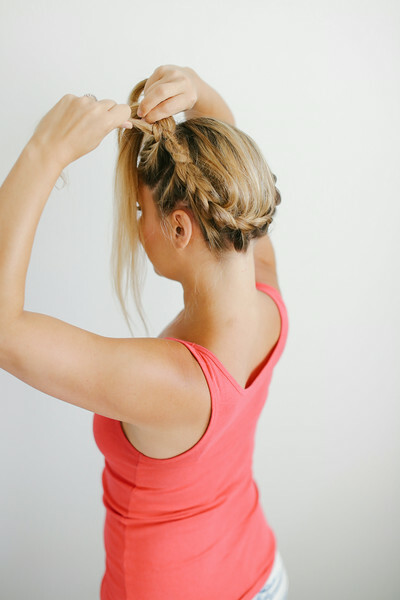 Braid all the way til you reach the end of your hair. Place the extra “tail” beside the braid. I kind of try to push the “tail” underneath the bigger braid slightly. You are going for a continuous braid. You will barely use any pins. The braid is super secure but you will need the pins for the extra hair you are trying to conceal. Now separate the braid. This is where you can mess up your masterpiece to make it look effortless! 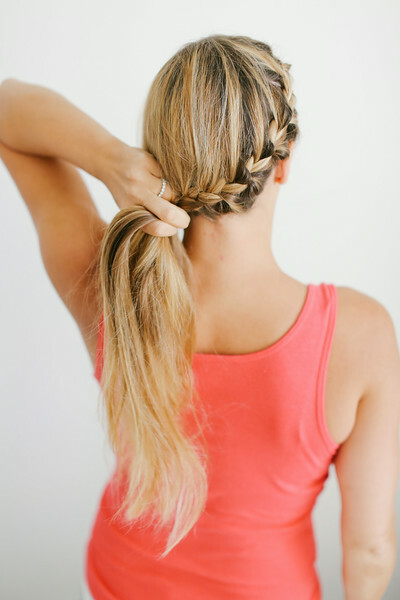 Just pull pieces away from the braid. I did this entire look in 4 minutes without a mirror. I know that hand switch is a bit tricky but the more you practice the easier it will be. 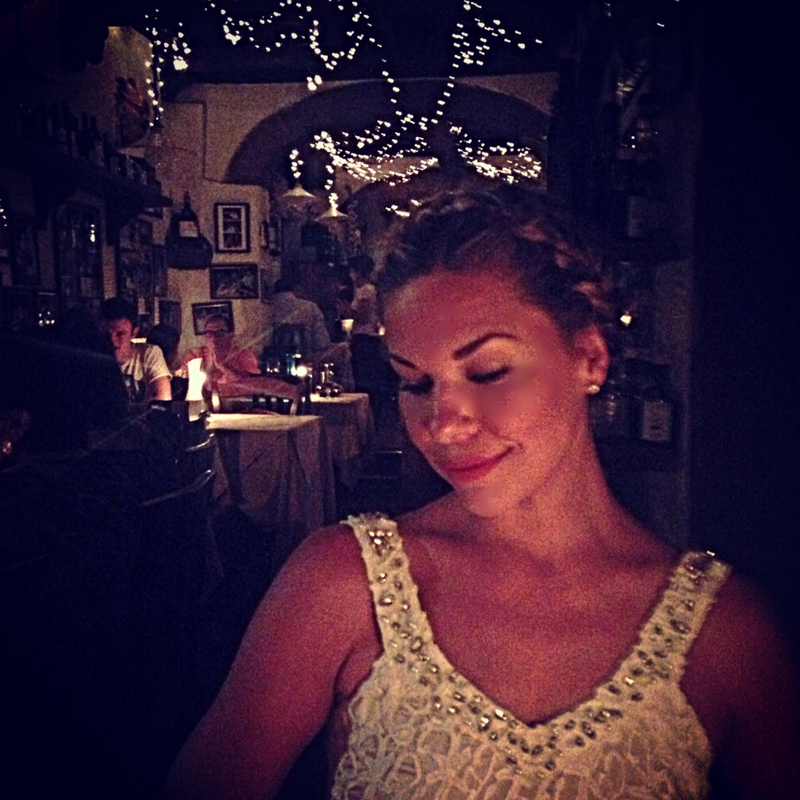 Here I am rocking the wrap-around braid in Florence, Italy on my honeymoon. See how romantic! Try this out on your next date night. I think you’ll get rave reviews! Let me know what you would love for me to cover next. Nails, makeup, clothes…you name it. I’m here for you! And again thanks for being such great supporters of Loftiss Says! 400 posts ya’ll! Let’s go for 400 more! Tags: braids, bridesmaids hair, DIY, diy hair, effortless hair, hair, hair expert, summer braids, summer hair, wedding hair. Bookmark the permalink.